This morning’s ride to work featured a rarity. A Linel sighting! Normally she rides to work about a half hour after me. She has been known to wear an invisibility cloak, too. But this morning I spotted her about 200 yards in front of me. I could tell it was her by her Nutcase helmet and super posh Surly Long Haul Trucker. I didn’t put the hammer down to catch her though. This was one of those mornings when I needed some alone time. (I’d be in much better biking shape if I were an extrovert.) To giv e credit where credit is due, Linel was going so fast the trees were blurry. Must have been using floo powder. Linel took a left onto South Royal Street. I continued straight to stay on the Mount Vernon Trail. As I passed under the bridge I saw some folks working on their fencing skills. Near the 14th Street bridge, the tree that had fallen during last night’s storm was still lying across the trail. To the left was a whole mess of standing water. To the right was only the slightest of openings. I went right. It looked blocked but I rode right through. Sweet. Somewhere near this point Chris M. rode past me heading south. He even took my picture. Portrait of Obliviousman. The ride home was a breeze. I was lost in thought about a son flying to Thailand, the disappointment of impermanent friendship, and a weekend begging to be filled with movement. Sometimes I wonder how I stay upright. Once clear of the airport, I was back in a trance. I am working from home tomorow. The gas company is replacing the gas line to my home. I want to be here if they blow something up. If they do, somebody else will have to continue this blog. I’ll be in orbit. 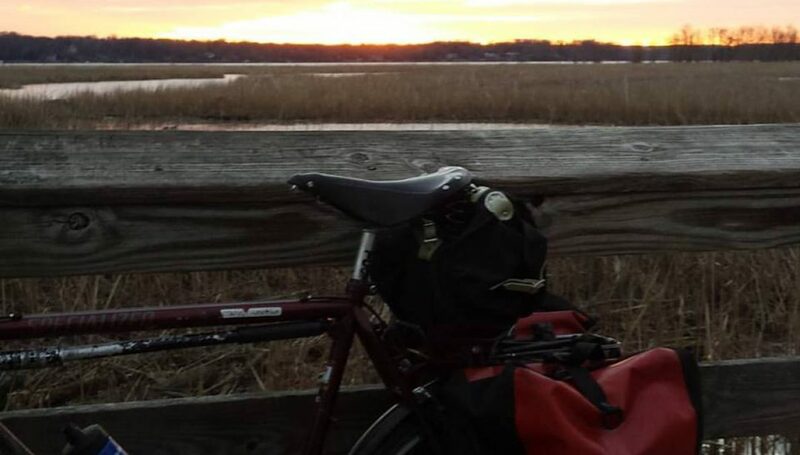 Posted on June 9, 2015 June 9, 2015 by rootchopperPosted in "Mount Vernon Trail", #bikedc, bike commuteTagged "Mount Vernon Trail", #bikedc, bike commute. No! You are not allowed to be blasted into outer space. I enjoy your posts and humor too much. I repeat, not allowed. Earth below us, drifting falling…. Ahhh! Goodbye rootchopper, have fun floating around in space…you will be missed. But at least you can claim that you are “out of this world”!